I have been so busy lately that I haven’t had a chance to do a blog post about the theater I’ve seen lately. The electronics course has mostly been responsible for my being busy—from March 20 to March 27 I was grading the huge pile of design reports for BME 51A, and classes started again on April 3. Two weeks into the new quarter, I’ve just finished grading the third set of homeworks for BME 51B, and I’m already tired of grading. (There are still six sets of exercises and five 5–10-page lab reports to come.) I have a non-course pile of “grading” to do also: I’m on a committee to evaluate 22 project reports from across the School of Engineering for Deans’ and Chancellor’s Awards. I’ve looked at four of them so far, and I have about a week to finish them. They are a bit bigger than the little design reports (7–67 pages), but generally better written, and I don’t have to read them closely—just rank them to figure out which are the most award worthy. The Strindberg play did not quite sell out the Colligan Theater, but it was well attended by the usual crowd of white-haired theater goers. Julie James gave herself one of the leads (what’s the point of owning a theater company if you don’t get to play lead? ), but this time she was well-cast in a part that matched her skills, unlike some of her earlier attempts to play parts for women 20 years younger. The play was well-acted, but the directorial decision to use MP3 players and laptops jarred with the text in several places. The set was a bit generic, but the costumes were good. Overall, I think that we all enjoyed seeing the play, but have no particular desire to see another production of it ever—it just isn’t that gripping a story. Over Spring break, my son and I both traveled by bus with people from Santa Cruz Shakespeare (staff, board members, and donors) up to Ashland, Oregon to see 5 plays there, to get a backstage tour, and to get a tour of the new production facilities in Talent, OR. My wife was unable to go, as her spring break is a week later than UCSC’s and UCSB’s. Of the five plays we saw, Shakespeare in Love was the most fun, Mojada had the strongest emotional impact, and Hannah and the Dread Gazebo was the most thought-provoking. The two Shakespeare plays were the weakest productions. The Julius Ceasar was a rather lack-luster production, with little attempt to get inside the characters’ heads, just showing us the public faces. I found the Brutus (played by Danforth Comins) particularly disappointing, portraying Brutus as a weak and vacillating figure, rather than a man of strong principles who was so moral that he attributed high principles to everyone around him. The dance theater elements really left me cold—it felt like I was watching a poorly produced music video on YouTube. The kata at the end seemed endless and monotonous. Others in our group had much more positive reactions to the play, and the reactions seemed to split based on whether or not people liked to watch dance. The dance fans loved the play, and the non-dance fans did not. The Henry IV, part 1 had a good Falstaff (G. Valmont Thomas) who was an excellent physical comic, and they really played the Eastcheap tavern scenes for all they could milk out of them, but the second half of the play fell flat. Some of the cross-gender casting worked well (Lauren Modica as Glendower, for example), but I was not thrilled by Alejandra Escalante as Hotspur. Don’t get me wrong—Ms. Escalante did a superb job of acting, but the machismo of the part made it very difficult. (Note: I’m not at all opposed to cross-gender casting—last year’s female Hamlet at Santa Cruz Shakespeare was by far the best Hamlet I’ve seen.) I think it would have been more interesting (though even more difficult) to make Hal be the female character—the father’s disappointment at not having a worthy son and Hal’s subsequent attempt to live up to the father’s dreams could have worked quite well as a female role, though the desire to keep the same actor for Henry IV, part 2 and for Henry V would have required a much bigger commitment to a female lead. Some of our party thought that Falstaff’s comic acting was too much like minstrel shows, with too much caricature of black culture. Others were uncertain whether Mr. Thomas was being directed to this caricature, or whether it was just his style of comic acting—I’m sure that black comics actors are forever wrestling with the dilemma of how to be funny to a wide audience without being disrespectful to their peers. I’d be interested in hearing how black theatergoers react to his Falstaff. Shakespeare in Love is a delightful romp through a lot of Shakespearean references (as well as big parts of Romeo and Juliet), and the actors and actresses all seemed to be thoroughly enjoying themselves. The play is pretty close to the movie (at least as I remember the movie), which is unusual in a stage-play adaptation of a movie. I was impressed by the teen actor playing John Webster (Preston Mead)—he did a good job of portraying a particularly ghoulish character.I think that this play will have the widest audience appeal of any of the five we saw. Hannah and the Dread Gazebo was the strangest play I’ve seen in some time, with a lot of dream sequences and non-linear story telling. All the money for the set was spent on a massive wall that tilted down to make a rooftop. We were told that the counterweight for the wall weighed 8000 pounds, and that combined with the rest of the wall, the total weight was around 10000 lbs. The counterweight was not taken out of the theater on the twice daily set changes, but the rest of the set was. I was particularly impressed with the lighting design (by David Weiner), as the set took on very different characteristics with no change in the set pieces, just from the lighting. The only disappointing set piece was the “gazebo” at the end, which was symbolically represented by a chandelier—this felt like a we’ve-already-overspent-our-budget move, rather than an artisitic choice. The quick costume changes needed by the Shapeshifter (Jessica Ko) were also technically very challenging (some of the changes had to happen on stage, as there was only 5–10 seconds for them). The play had an emotional resonance for some of the Asian-Americans in our group and perhaps a few other second-generation immigrants, but I found it more of an intellectual puzzle than an emotional play (despite being a second-generation immigrant myself). I really needed more time to ponder it, but we had Mojada to see the same evening, which rather cut short my time for rumination. Mojada was definitely a gut-punching play (as you would expect from any adaptation of Medea). The script kept many of the elements of Euripedes’s play, though a number of characters were conflated to reduce the cast size. The acting was strong, but I found the set rather distracting—trying to make an L.A. slum apartment look like Baba Yaga’s hut was a little too strained. They might have been better off producing the play on a bare stage. The high point of the trip to Ashland was not the five plays (though they were definitely worth seeing—or the 3 non-Shakespeare ones were). The high point was visiting the production facilities in Talent, OR. The custom-built space is a Makerspace par excellence for theater lovers. They have all the usual tools: 3D printers, laser cutter, CNC router, CNC lathe, machine shop, two wood shops (props and scenery), spray paint booth big enough for a car, robotics workshop, … with huge amounts of space. One wall of the paint shop has a grid large enough to hang the largest flies that any of their theaters can use, with theatrical lighting for it so that they can paint the backdrops vertically, rather than having to lay them on the floor. Their scene shop has a full-size mockup of the theater stages, complete with a 14-foot-deep pit for testing lifts to the stage, and that mockup is a small fraction of the whole scene shop. Almost half the building is taken up with storage for costumes and props. 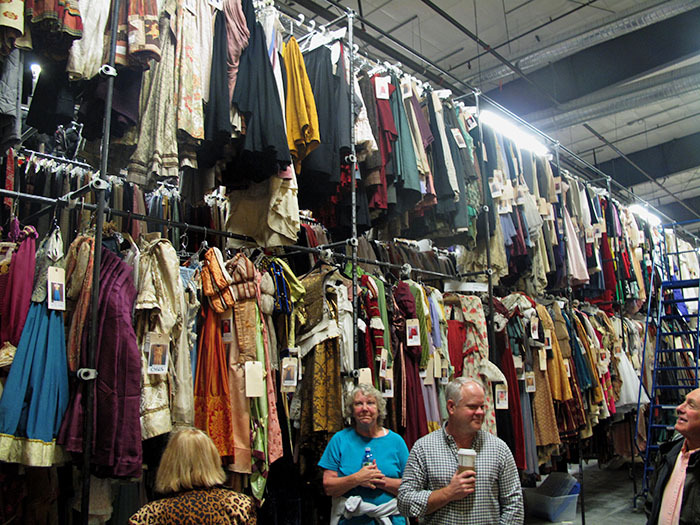 The costume collection is amazing, and they rent out everything to theater companies and schools (with a big discount for community theaters and schools). Almost everything is photographed and indexed on the web (https://www.osfcostumerentals.org/OSF-Costume-Rentals). The props are not so well indexed nor do they have a formal rental program, though they have occasionally rented out pieces on a case-by-case basis. This wall of shoes is part of the shorter wall of the room—the long wall would not fit in any of my pictures, nor would the many rows of racks double-height racks of clothes. I took a few pictures in the costume storage area, but none were able to capture the sheer magnitude of the space and the overwhelming number and variety of costumes. This picture shows just a tiny fraction. The most recent play I’ve seen is Jennifer Haley’s The Nether, which is still showing at Center Stage (through April 29). The play is intended to be thought-provoking (about what standards should apply to online entertainments), but the themes are a bit tough for many audience members: child abuse and murder of virtual characters. Like in many science fiction works, there was a bit too much exposition, but the actors managed to keep things moving despite that. The highlight of the play was the performance by Olivia Gillanders, a fourth-grade student who played the role of Iris, the child avatar that is abused and murdered (off-stage). Nick Bilardello as Mr. Doyle and Andrew Davids as Mr. Sims were also quite good. I felt that the April Bennett (as Detective Morris) and Robert Gerbode (as Woodnut), did decent jobs, but were not up to the caliber of the rest of the cast—their delivery was sometimes a bit wooden, and the characters lacked the intensity of the others. Part of that may be in the script—the characters didn’t have as good lines—but they could have done more with what they had to work with. The set was very simple, being split between an interrogation room (stage right) and the virtual world called the Hideaway (stage left). The interrogation room was done in greys and ultra-utilitarian furniture, while the Hideaway attempted to be a lush Victorian parlor (not quite successfully, as the theater company lacked the budget, but well enough to give the impression of a virtual-world Victorian parlor). I felt a little sorry for the actors, as the house was only about half full last night (I don’t think I’ve ever been to a production at Center Stage that was not sold out before, as the house only seats 89 including the wheelchair spot). The play is worth seeing, and there are two more weekends (tickets at http://www.brownpapertickets.com/event/2729920). I recommend that people buy tickets, even if they can’t go, in order to keep small theater companies from going bankrupt in Santa Cruz. In addition to these plays, other recent cultural events include Viva La Lehrer IV (April 8 @ Kuumbwa Jazz, a celebration of Tom Lehrer songs) and a visit to the crochet coral reef on display at the Porter Sesnon Gallery at UCSC (which my wife and I went to April 14). The Lehrer songs were fun, though I could quibble with some of their selections and how much time they gave to the weaker performers compared to the stronger ones—I don’t feel any need to go to Viva La Lehrer again for about another 5 years. The CO2CA-CO2LA Coral Reef exhibit runs at the Sesnon gallery until May 6. I recommend it for kids as well as for adults (one part is mounted in a dark room that you explore with flashlights).